Here is a simple, healthy salad that everyone will love! Fresh, easy and pretty enough for company, this Balsamic Fig Salad can be tossed together in no time. I like to assemble the greens on individual glass plates and cover with plastic wrap and refrigerate until serving time. This pretty salad takes advantage of fresh strawberries and can be easily varied to include other fresh fruits such as diced apples or fresh blueberries for a color explosion on your plate. 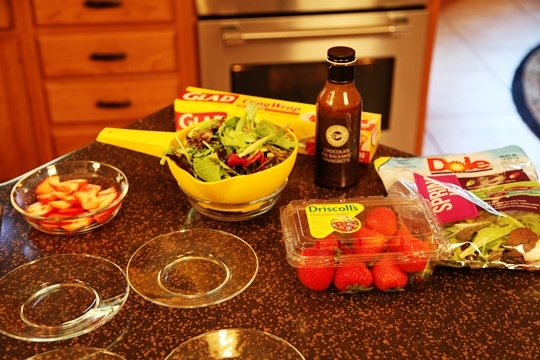 I topped the greens and strawberries with the Chocolate Fig Balsamic Vinaigrette from Dove Chocolate Discoveries. This dressing can be ordered online and shipped right to your door. I think the chocolate and fig combination is a delightful flavor combination. You could also top it with bottled Poppy Seed Dressing or another bottled balsamic dressing. 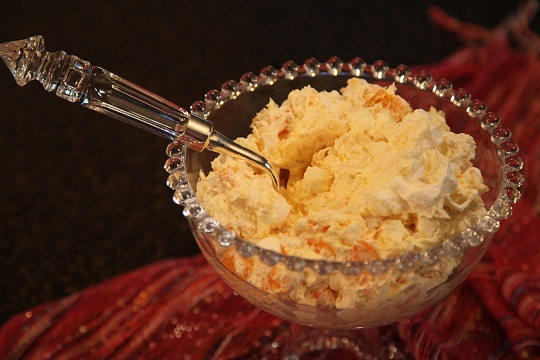 If you want to expand the recipe, add a cheese such as crumbled feta, Gorgonzola, Blue Cheese or crumbled goat cheese. Arrange the salad greens on a salad plate. Top with sliced fresh strawberries. Drizzle with salad dressing. Rinse the the lettuce greens in a colander and dry on paper towels before assembling. You can get creative and vary the fruit, add crumbled cheese or even add toasted nuts to the mix. Just remember that you can assemble this recipe ahead of time and avoid any last minute rush at mealtime. Sometimes the simple things are the best….and this is a super simple recipe that will round out any meal. This recipe was given to me over 30 years ago by my girl’s Grandma Great. It’s full of pineapple, mandarin oranges, marshmallows and creamy vanilla pudding. It goes together in a snap and you can serve this as a side salad or a light summertime dessert. This can also be made ahead and frozen until needed. Our family has enjoyed this recipe many times over the years and I think your family will like it too! Mix crushed pineapple and dry pudding mix together. Stir in mandarin oranges and marshmallows. This can be made ahead and frozen until needed. Mix pineapple with dry pudding mix. Stir to combine and chill until serving time. 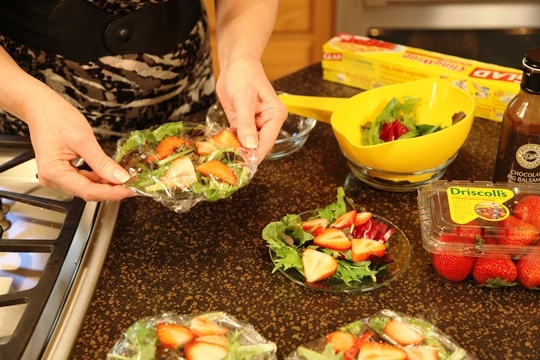 To serve as a dessert, place Cool Summer Salad in Martini glasses or individual serving bowls.